On this episode we talk about the murders of Tupac Shakur and Biggie Smalls. These two, seemingly related, murders have left people scratching their head and noone has been convicted of their murder yet. We explore the wild and wide ranging theories into their deaths; such as police involvement, gang activity, an insidious murder plot by those entrusted with their well-being, or were the incidents faked somehow and these men are still alive? Many documentaries and investigations have taken a swipe at solving this case from witness testimony and hard evidence but it is still unsolved after twenty years. On this episode we dust off our do-rags and dive deep into the biggest beef in hip-hop history which led to the deaths of both parties and left a whole world still wondering how; The Tupac and Biggie Murders. In 1996 Tupac Amaru Shakur was shot as he left the MGM Grand Casino in Las Vegas. He was in the car of his manager Suge Knight who was also shot. Knight who was the owner of his record label Death Row Records, is suspected of having a hand in the crime, as well as organising the shooting of Christopher ‘Biggie Smalls’ Wallace. The East Coast West coast beef started when Tupac, a nomadic and prolific actor and musician, moved from his east coast roots to join Death Row Records in Los Angeles, California. Tupac was paranoid that former producer Sean ‘Puff Daddy’ Coombes and Notorious BIG were responsible for him being shot in the Quad Studios in New York. This shooting however, may have been a result of Tupac’s allegedly affected gangster image and his message of ‘Thug Life’ became all to real when a robbery turned shooting was a precursor to him being convicted for sexual assault an put into prison. Christopher Wallace AKA Notorious BIG AKA Biggie Smalls was a New York rapper through and through. His label Bad Boy Records, headed by the now infamous P. Diddy Coombes, were the ones held responsible for Tupac being shot in Las Vegas after a Mike Tyson fight. Wallace, who had a troubled youth, being involved in drug dealing and gang activity from his early teens and even spending some time in jail in North Carolina for drug offences, was shot only 6 months after Tupac was. These gang type killings were a huge blow to the music industry and kicked off a series of revenge killings between rival gangs across the United States. The shootings were attributed to gang activity, with Suge Knight being heavily involved in the West Coast gang, The Bloods, particularly a faction knows as the Mob Pirus. 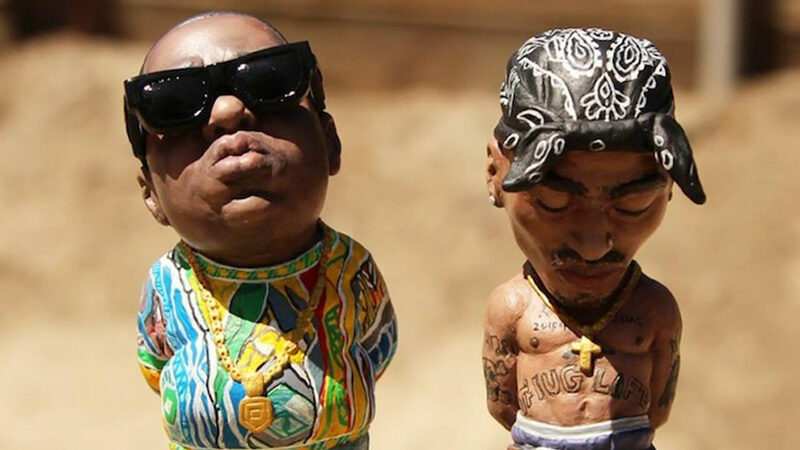 They were the ones who were allegedly involved in the shooting of Biggie. The Crips, the blue lads, were the ones initially held responsible for the shooting of Tupac after an altercation in the Casino and this was the commonly held belief. A former police officer and investigator Russell Poole had an alternative theory that placed crooked LA cops at the feet of Suge Knight and at the disposal of Death Row records, and this is what starts the ‘inside job’ conspiracy. Poole and his theory, laid out in the book Labyrinth, was made popular by the Nick Broomfield documentary ‘Biggie and Tupac’ where he claims the involvement of a David Mack and a host of his cohorts as being responsible for Tupac’s death. The man who they claim shot Biggie was a one Harry Billups AKA Amir Mohammed and was a member of The Nation of Islam. This is to coincide with the theories of trouble between Bad Boy and the Black Muslim community. All of these theories were then poo-pooed in a more recent book by Greg Kading, another police office who worked on the Biggie Smalls case, who used witness testimony to clear up any confusion of conspiracy and lay out a set of ‘irrefutable’ facts and confessions that confirms the original story from almost 20 years earlier. So with all these alternating versions of events, evidence pointing every other way, dead witnesses, dead suspects, dead ends, no leads, possible discountable witness testimony, and a host of other mitigating factors; is there any wonder that the killings of these two men are still being talked about today. They still havn’t caught the killers which is a mystery in itself but what is more interesting is, some say that Tupac is still alive and living in Cuba. We explore all avenues of investigation and wonder if Tupac’s mothers involvement in the Black Panther movement and both Tupac and Biggie’s influence in the Black community in the US had any hand in their deaths. Were they silenced like so many influential members of the entertainment community before them, or was it just a straight up gang shooting? Join us as we try to unravel this 20 year old mystery!